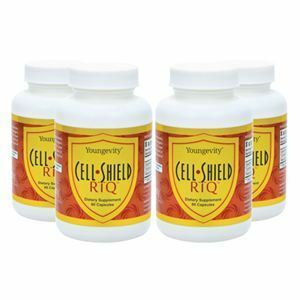 Cell Shield RTQ offers a highly bioavailable proprietary mix of three powerful antioxidants (resveratrol, curcumin and quercetin) for powerful protection against free radicals that damage cells. For best results, use Cell Shield RTQ as part of a complete nutritional program that includes Beyond Tangy Tangerine® and Ultimate EFA Plus . WARNING: If you are pregnant, nursing or taking medication, consult your health professional before using this or any other product. KEEP OUT OF THE REACH OF CHILDREN. Quercetin Dihydrate, Turmeric Root, Resveratrol, Vegetables Capsule, Magnesium Silicate, Silicon Dioxide, Magnesium Stearate, Vegetable Cellulose.